Most makeup formulations include safe ingredients, which are typically non-comedogenic (won't clog pores), non-irritating, and hypoallergenic. However, some individuals may experience skin irritation when using certain kinds of makeup products. The irritation may occur due to bismuth oxychloride or formaldehyde-releasing agents, and some makeup products may contain comedogenic (pore-clogging) ingredients. Overall, though, most makeup ingredients are safe for use on the skin. This article will touch on the various types of makeup products, how they are made, and what, if anything, there is to watch out for. Makeup primer is a cream, gel, or lotion that is applied on the face before other types of makeup. The main roles of a makeup primer are to prepare the skin for makeup by smoothing small wrinkles and large skin pores, and to ensure that it stays longer on the face, especially in hot and humid weather. It can also act as a moisturizer or, depending on the ingredients in the primer, absorb excessive sebum (skin oil) from the face. The removal of excess sebum provides a matte finish to the skin. 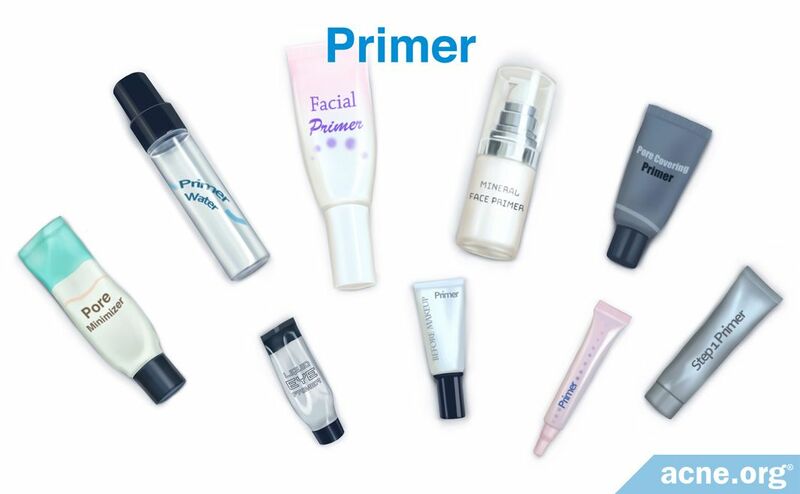 Primer is composed of water and silicone compounds (more below about them) and optionally may contain emollient ingredients, vitamins A, C, and E, hydrating substances (e.g., sodium hyaluronate), UV-absorbing ingredients, which protect the skin from the sun's rays, and different types of herbal extracts. The major ingredients of liquid foundations are divided into two groups. Water-based foundations contain a mixture of water and mineral oil or silicone. In the past, makeup was made with vegetable oils. However, due to vegetable oil's potential to clog pores, silicones are now used in their place. Water-based foundations contain more water (50 - 60%) than silicone, which is the reason they are considered water based. These foundations are more suitable for people with normal to oily skin. Filling ingredients, including talc, mica, sericite, and bismuth oxychloride, help to spread the covering ingredients onto the face. Covering ingredients include titanium dioxide, zinc oxide, and kaolin, which is a type of clay. These covering ingredients produce a white color that helps to cover skin imperfections. Titanium dioxide and zinc oxide can also provide some protection from the sun. There are four levels of coverage. Sheer coverage provides 8 - 13% coverage and only partially covers skin imperfections. Light coverage provides 13 - 18% coverage and can help even skin tone and hide freckles. Medium coverage provides 18 - 23% coverage and can cover discoloration, red marks, and blotchiness. Full coverage provides 23 - 35% coverage and can completely cover hyperpigmentation, birthmarks, scars, and vitiligo, which is a skin condition that causes depigmented patches of skin. Coloring ingredients include iron oxides that are red, yellow, and black. These mix in with foundation to create different shades that resemble a wide range of natural skin colors. Unifying ingredients include a variety of substances that help emulsify other ingredients to create a uniform foundation that does not separate into individual components. These ingredients, which are also called emulsifiers, help the water portion and the oil or silicone portion of the foundation stay together, instead of separating out like water and oil do if you put them in a glass. Preservatives comprise a variety of substances that help prevent the growth of bacteria and fungi. 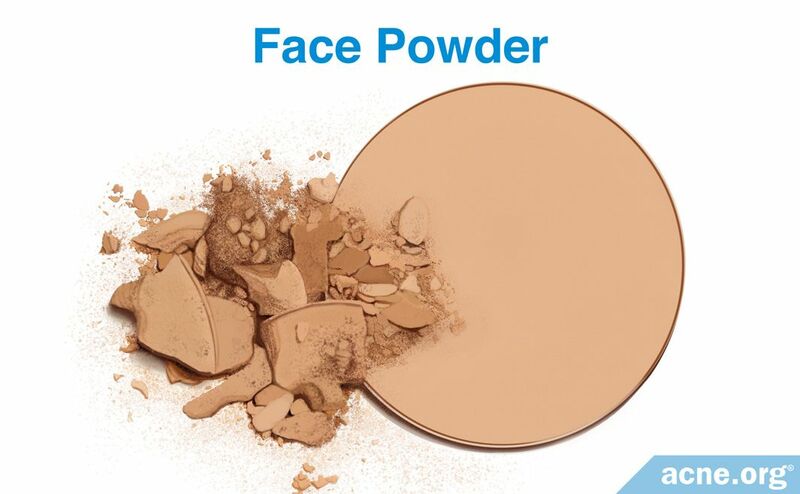 Filling ingredients, such as talc and sericite, help evenly spread face powders on the surface of the skin. Chalk or kaolin absorb moisture and oil from the skin's surface. Magnesium stearate ensures that the powder stays on the skin. Covering ingredients comprise zinc oxide and titanium dioxide. Coloring ingredients include iron oxide and carmine. Unifying ingredients include nylons, polyamides, and silica. Preservatives include a variety of substances that prevent the growth of bacteria and fungi. Concealers are color correctors that are only applied to problematic areas of the skin, such as dark circles, age spots, large pores, acne lesions, and red or dark marks left after an acne lesion heals. 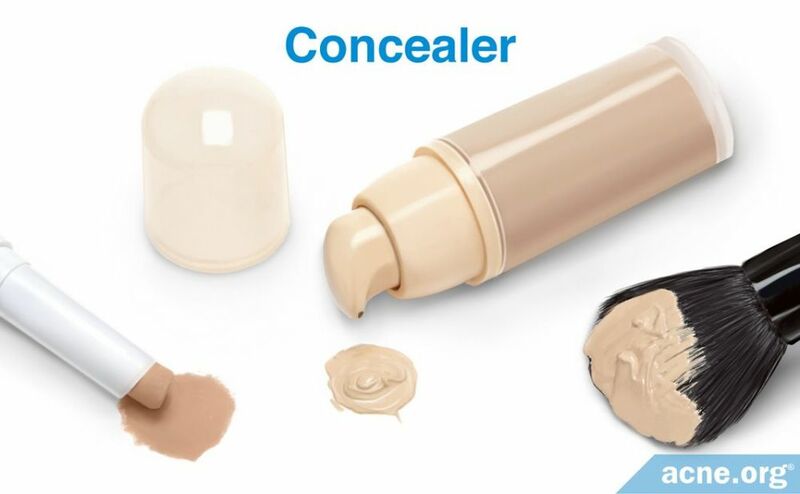 Concealers can be applied before or after foundation, depending on personal preference. Their composition is similar to that of foundation and face powders, but they generally contain more covering ingredients. When formulated for normal skin types, concealers can be thick and greasy because they contain additional oils, like castor oil, macadamia oil, or shea butter, but are replaced with silicones when formulated for acne-prone skin. 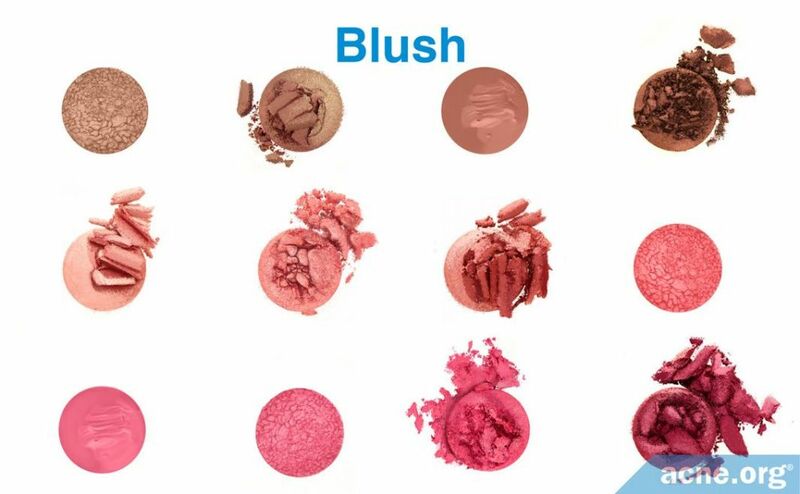 Blushes mainly come in the form of pressed powders that provide one of three main finishes: matte, shimmering, or satin. The main ingredients of blushes are red-colored talc powder, mica, adhering ingredients, i.e., zinc or magnesium stearate, and unifying ingredients, namely, silica boron nitride. Compared to foundations and powders, blushes may contain a wide variety of pigments - not just iron oxides - but also organic dyes, such as D&C Red pigments and FD&C Yellow pigments. Mineral makeup is composed only of minerals, including substances like talc, zinc oxide, titanium dioxide, and iron oxides. 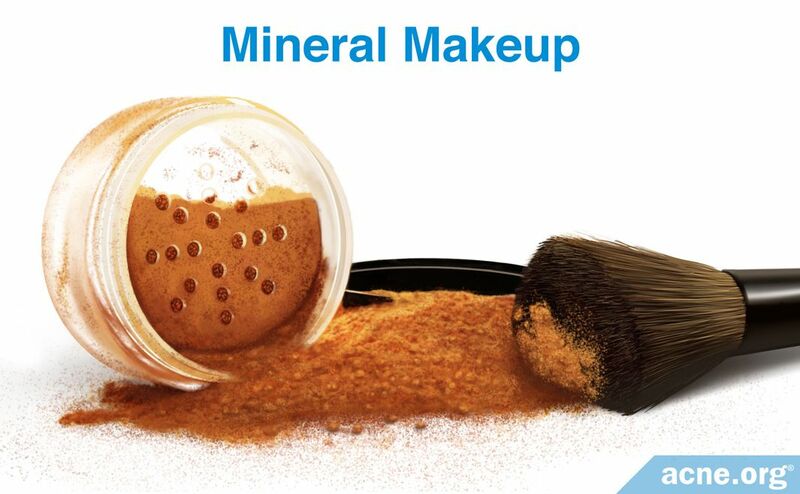 To produce mineral makeup these minerals are finely ground into a powder. Mineral makeup does not contain any oils, waxes, fragrance, or preservatives, and therefore some people consider it safe compared to conventional makeup. However, equally safe versions of conventional makeup are also available. 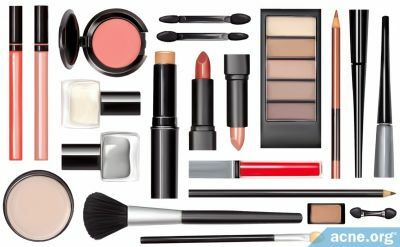 Research investigating the toxicity of several makeup ingredients has found that the overwhelming majority of all makeup ingredients are safe to use. Volatile silicones are substances that quickly evaporate after application to the skin. When evaporated from the skin, they leave a thin coating of makeup that is evenly distributed across the entire face. Volatile silicones are most commonly found in foundations, and their purpose is to combine the other ingredients in makeup. They also allow for fast spreading of the product onto the skin. Examples of volatile silicones include cyclosiloxanes (cyclomethicone). On the internet, some people have raised concerns that volatile silicones are bad for the environment, but research has not proven these concerns to be true. From what we currently know, they are considered safe. Polymeric silicone compounds are substances that do not evaporate after application of the makeup. They also mix other ingredients in makeup and make it easier for people to spread on the skin. Polymeric silicones are preferred because manufactures find them easier to create than volatile silicones, and they have a smooth, non-greasy feel. Research shows that such compounds also are safe to use. Filling ingredients are added to makeup to help spread it across the face. 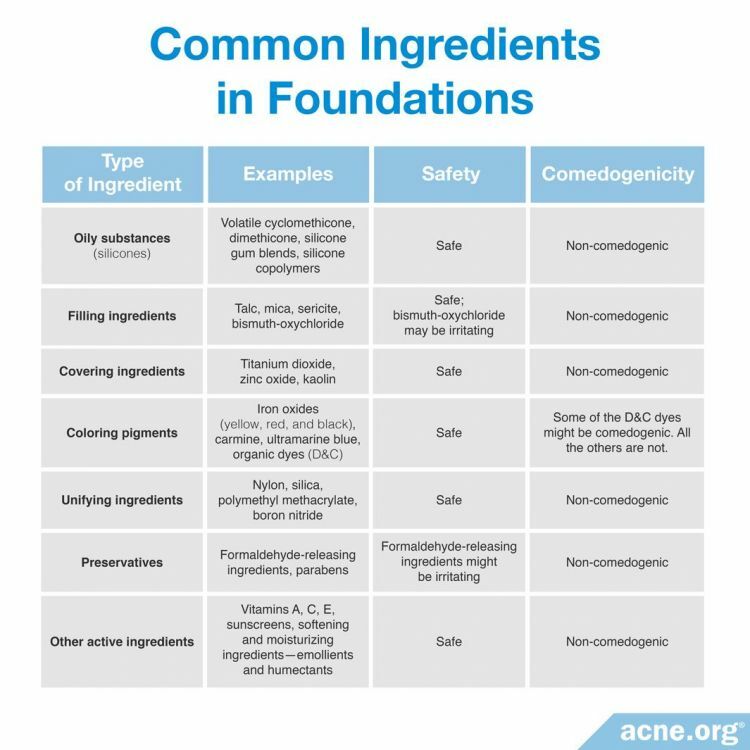 Let's examine the safety profile of the most common filling ingredients in makeup. Mica is a silicate mineral that is used as a fine powder in cosmetic products. It is non-irritating, does not clog pores, or cause acne. As mica is harvested from the earth, it can contain small amounts of heavy metals that can be toxic to humans. However, the Food and Drug Administration (FDA) regulates the amount of heavy metals in mica, and therefore it is safe to use in cosmetic products like makeup. Sericite is a finer ground version of mica. Like mica, it is non-irritating, and does not clog pores or cause acne. Covering ingredients are added to makeup to even skin tone, partially cover skin imperfections, and may also help protect against harmful rays from the sun. However, some covering ingredients are not safe for cosmetic use. Unifying ingredients help to keep the different ingredients in makeup mixed, making for a uniform foundation. 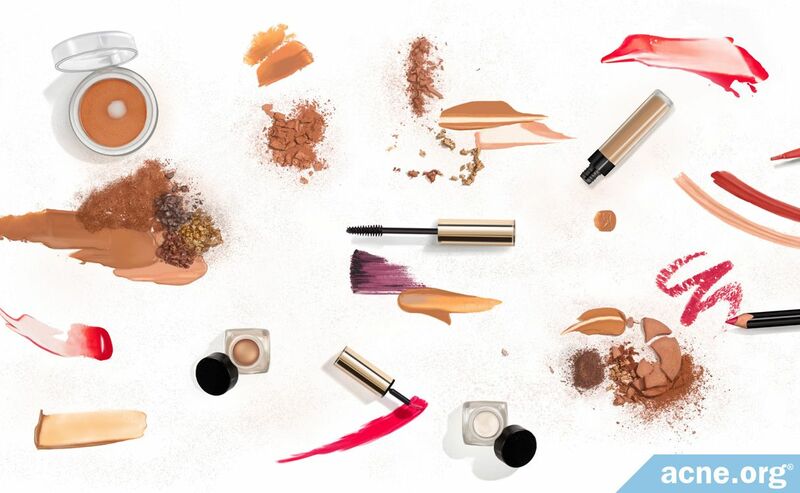 Essentially, unifying ingredients ensure that the water and oil components of makeup products remain mixed, instead of separating out in the makeup container. The two most common unifying ingredients used in makeup are boron nitride and nylon, and both are considered safe to use. Preservatives are included in cosmetic products because they prevent the unwanted growth of bacteria and fungi. There are two main types of preservatives used in makeup. 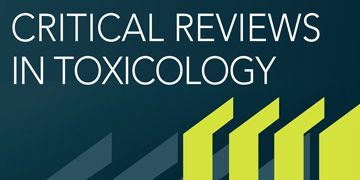 A 2005 study published in the journal of Critical Reviews in Toxicologyfound that daily exposure to parabens may pose some risk to human health. No studies examine the effect of parabens on acne, but because they mimic estrogen, it is possible that they act similarly to estrogen to reduce the production of sebum. Consequently, it is unlikely that parabens would cause acne outbreaks. Occasionally, producers of makeup incorporate fragrances into makeup products to improve the smell. However, some people are sensitive to these fragrant chemicals and may develop allergies to them. 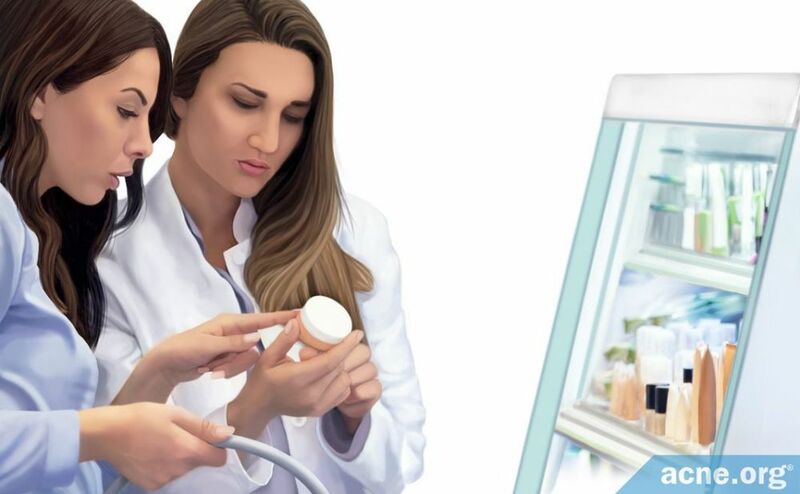 A 2000 study published in the British Journal of Dermatology reviewed the data from 25,545 patients that had undergone allergy testing during a period of 16 years. They found that 8.5% of females and 6.7% of males had an allergy to a chemical used for fragrance. From all the points made above, it may be concluded that today's makeup products contain relatively safe, carefully chosen ingredients. Most reputable cosmetic companies choose ingredients which are non-irritating, non-comedogenic (non-pore-clogging), non-acnegenic (will not cause acne), and hypoallergenic (will not cause an allergic response). When choosing makeup, it is safer to select products which contain such characteristics on the label. Also, companies such as Neutrogena® and Almay® (note: Acne.org is not affiliated with these companies) offer makeup product lines specifically designed for acne-prone skin. If you prefer to use regular makeup products, it may be helpful to follow certain guidelines, although official dermatology does not provide recommendations. If you suffer from acne outbreaks, it would be better to avoid heavy makeup products, that is to say, those which are labeled as "long lasting," "full coverage," "24-hour wear," etc. 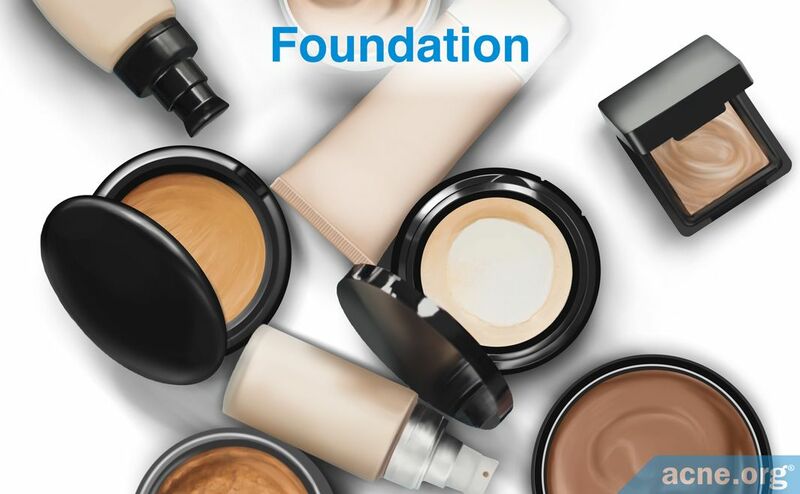 For foundations, it is best to choose sheer (light) coverage and scrutinize the ingredients, watching out for any which may be comedogenic. You may find the list of comedogenic ingredients here. 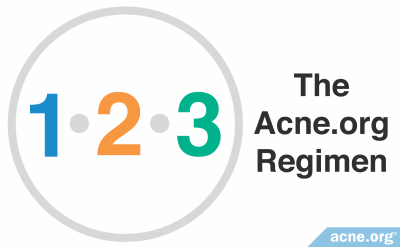 If you are in the process of clearing your acne with a chosen daily routine, such as the Acne.org RegimenTM, it is advisable not to incorporate makeup. It would be difficult to determine whether regress occurs because of makeup application or another factor. Once you figure out how to keep your skin clear, it is OK to include makeup in your regimen. Several studies proved that patients with acne or other dermatological disorders can benefit and improve their quality of life by using makeup. You can read more about the effects of makeup on patients with acne-affected skin here. 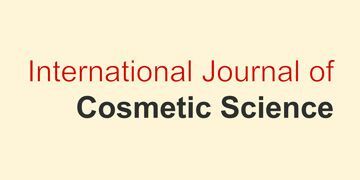 Handbook of Cosmetic Science and Technology. Third edn, (Informa Healthcare, 2009). Goddard, D. Principles of Polymer Science and Technology in Cosmetics and Personal Care. (Marcel Dekker, Inc., 1999). Johnson, W. Jr. et al. Safety Assessment of Cyclomethicone, Cyclotetrasiloxane, Cyclopentasiloxane, Cyclohexasiloxane, and Cycloheptasiloxane. Int J Toxicol 30, 149S - 227S (2011). Wehner, A. P. Biological Effects of Cosmetic Talc Food Chem Toxicol 32, 1173 - 1184 (1994). Mohan, R. Green Bismuth. Nat Chem 2, 336 - 337 (2010). Lansdown, A. B. Physiological and Toxicological Changes in the Skin Resulting from the Action and Interaction of Metal Ions. Crit Rev Toxicol 25, 397 - 462 (1995). Lademann, J. et al. Penetration of Titanium Dioxide Microparticles in a Sunscreen Formulation into the Horny Layer and the Follicular Orifice. 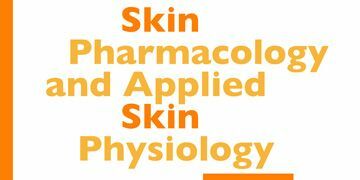 Skin Pharmacol Appl Skin Physiol 12, 247 - 256 (1999). Pflucher, F., Hohenberg, H., Holzle, E., Will, R., Diembeck, W. & Gerls-Barlag, H. The outermost stratum corneum layer is an effective barrier against dermal uptake of topically applied micronized titanium dioxide. Int J Cosmet Sci 21, 399 - 411 (1999). Schwartz, J. R., Marsh, R. G. & Draelos, Z. D.Zinc and Skin Health: Overview of Physiology and Pharmacology. Dermatol Surg 31, 837 - 847 (2005). Fiume, M. M. et al. Safety Assessment of Boron Nitride as Used in Cosmetics. Int J Toxicol 34, 53S - 60S (2015). Safety Assessment of Nylon as Used in Cosmetics. (Cosmetic Ingredient Review). Golden, R., Gandy, J. & Vollmer, G. A Review of the Endocrine Activity of Parabens and Implications for Potential Risks to Human Health. Crit Rev Toxicol 35, 435 - 458 (2005). Buckley, D. A. et al. The frequency of fragrance allergy in a patch-test population over a 17-year period. Br J Dermatol 142, 279 - 283 (2000).